A couple weeks ago I reviewed Hero Camp #1 and made some guesses about how issue #2 would work out for me. I enjoyed the clever, playful character designs from Robbi Rodriguez, and I liked the silly, almost vaudevillian humor from Greg Thompson’s script; my main gripe, on the other hand, was with Thompson’s hints that this would become a more serious story, a coming of age tale that I thought didn’t fit the tone and style of the book. Ultimately I decided it was worth the gamble to pick up Hero Camp #2. It’s good news, today: Thompson must have gotten my letters and had Rodriguez bang out some new art mighty fast, because this second issue does exactly what I thought it should, and surprises me a little bit at the same time. 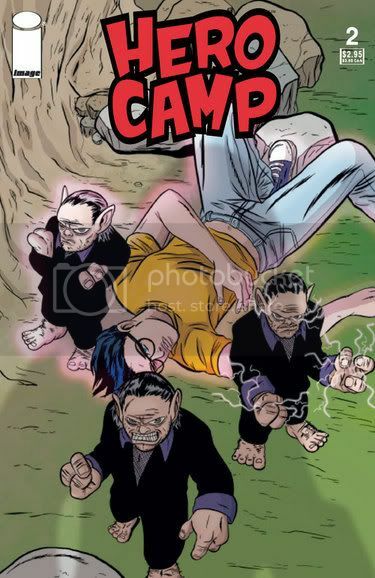 The first half of this issue is a really entertaining tour through the world of Hero Camp, presented as Our Hero, Eric, strolls around the campgrounds on a lazy Saturday, running into friends and seeing what they’re up to. I’ve already talked about how much I like Rodriguez’ entertaining character designs, but the spotlight shifts here as Thompson gets to show off his own clever sense of humor through several snapshot character moments. These scenes are breezy and whimsical, and when the plot (such as it is) kicks in halfway through, it feels like the more perilous elements of the story are meshing better with the book’s tone than last time around – this is probably because of three great new characters that are both well-written and wonderfully designed and rendered. They’re all basically the same character, but their presence on the page is charismatic and funny. The back-up story was the strongest element in the first issue, but I think it veers off a little too much this time. I like the bits where the super-kids are talking about their childhood dreams, what they wanted to be before the super-hero path became clear. When the circle comes around to Eric, and he says he wants to be a writer – I’m sorry, no. I’ve read that scene, heard that monologue, and listened to that song a hundred times already. Hell, Neil Simon writes it in every single play. It’s a sweet scene, clearly intended to communicate Thompson’s passion for his craft and its possibilities, but it’s not nearly as imaginative a moment as I now know he’s capable of. This is a hard series to pin down, and I’m surprised to find that out. Hearing the concept and reading the first issue made this seem like a fairly obvious book to me – Misunderstood Kid Finally Comes Out Of His Shell, right? – but at this point I don’t know where the series is going. This issue tells a self-contained story, which is pretty unusual in a four-issue mini with a built-in character arc in the premise. And where usually by this point in a miniseries the introduction of characters and ideas would have slowed down, if anything it feels like the new stuff is accelerating. It leaves me feeling optimistic about the rest of the series, hoping Thompson’s got the guts to just keep going whole hog and slamming out new stuff with abandon. This series doesn’t need a story, exactly; the story’s in the premise, and it’s been done – it should be the road, not the car. Right now I’m getting the idea that Thompson understands that, and I’m looking forward to finding out if I’m right.